This leaflet is to help explain about Intraventricular Haemorrhage (IVH). Most of your questions should be answered by this leaflet. It is not intended to replace the discussion between you and your baby’s doctor, but may act as a starting point for discussion. If after reading it you have any concerns or require further explanation, please discuss this with a member of the healthcare team caring for you baby. 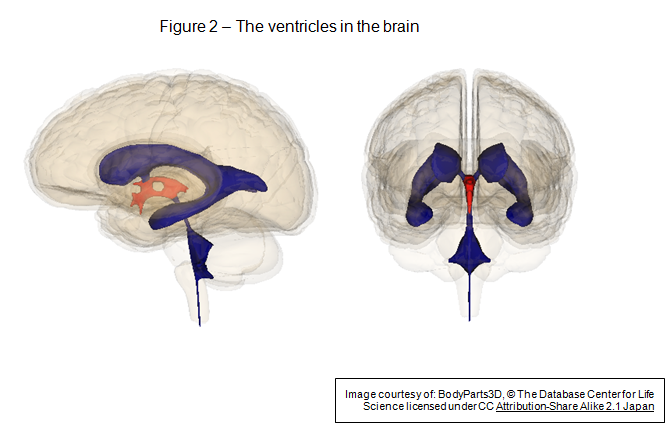 The normal brain contains fluid-filled spaces called ventricles. IVH is bleeding (haemorrhage) into these fluid-filled spaces. IVH usually happens in the first week of life in premature (born early) babies. There are often no obvious signs that your baby has had an IVH. All premature babies less than 32 weeks have head scans in the first few weeks of life. These scans pick up if there has been an IVH. A head scan is done through the ‘soft spot’ on your baby’s head and is done with an ultrasound probe – similar to the one used for the pregnancy scans. IVH happens due to bleeding from very small, fragile blood vessels in an area of the brain next to the ventricles. IVH usually only happens in premature babies and is more likely if your baby is born weighing less than 1kg (2lb 3oz). There is currently no specific treatment for IVH. The bleeding usually stops by itself and gradually improves – like a bruise. Your baby will have repeat head scans to check that the IVH is getting better and that the brain is developing as it should. Your baby will receive the same care and support as all premature babies on the neonatal unit. What are the different types of IVH? IVH can be small; in these cases the area of bleeding is just next to the ventricles. These are less likely to cause long-term problems. IVH can be very large, in some cases filling the ventricles and they can cause damage to areas of brain close by. These larger bleeds are more likely to cause long-term problems. We know that there are lower rates of IVH in premature babies when their mother has received a course of steroid treatment during the pregnancy. There are currently studies looking into medicines to treat or prevent IVH. What does it mean for my baby and what is the outlook? In most affected babies the IVH is small and will gradually resolve over the next few weeks. These babies usually have no long-term problems from the IVH. Some babies, especially those with large IVH, can have long term problems due to damage to the brain. This may result in problems with development, the muscles and nerves, or less commonly problems with hearing or vision. Some babies also can develop swelling of the fluid around the brain after an IVH causing the head to become bigger (hydrocephalus). This sometimes needs an operation to drain some of the fluid. This is due to the blood ‘clogging’ the area where the fluid around the brain normally drains. It is difficult to tell how severe long term problems later in life will be, as it depends on many other factors that may have affected your baby due to their prematurity. All significantly premature babies with or without IVH are followed up in clinic, to monitor their development and the size of their head. Before any doctor, nurse or therapist examines or treats your child, they must seek your consent or permission. In order to make a decision, you need to have information from health professionals about the treatment or investigation which is being offered to your child. You should always ask them more questions if you do not understand or if you want more information. We collect and use your child’s information to provide your child with care and treatment. As part of your child’s care, information about your child will be shared between members of a healthcare team, some of whom you may not meet. Your child’s information may also be used to help train staff, to check the quality of our care, to manage and plan the health service, and to help with research. Wherever possible we use anonymous data. We may pass on relevant information to other health organisations that provide your child with care. All information is treated as strictly confidential and is not given to anyone who does not need it. If you have any concerns please ask your child’s doctor, or the person caring for your child. Under the General Data Protection Regulation and the Data Protection Act 2018 we are responsible for maintaining the confidentiality of any information we hold about your child. For further information visit the following page: Confidential Information about You. If you need information about your child’s (or a child you care for) health and wellbeing and their care and treatment in a different format, such as large print, braille or audio, due to disability, impairment or sensory loss, please advise a member of staff and this can be arranged. An NHS number is allocated to everyone whose birth is registered with a Registrar of Births and Deaths in England and Wales. You already have an NHS number and your baby will be assigned an NHS number soon after birth. Your NHS number is unique to you and provides a reliable means of linking you to the medical and administrative information we hold about you. NHS numbers are allocated on a random basis and, in themeselves, provide no information about the people to whom they relate.